Today’s blog is about my Honey Roy’s 62nd birthday and our tiny RV washer dryer. They have nothing in common but it’s my blog so they go together! All of his coworkers, Chip, Madisyn and I sang Happy Birthday to Roy and shared the delicious cake. He’s never been big on birthdays but I knew this was my last chance to have an office birthday party for him so we did it and he was happy! Our coworkers haven’t seen Madisyn for several months since she moved to Florida so they got to see how much she’s grown. She even sang “Twinkle, Twinkle” and the “ABC” song for them and wasn’t shy about it at all. She’s becoming a great little performer! 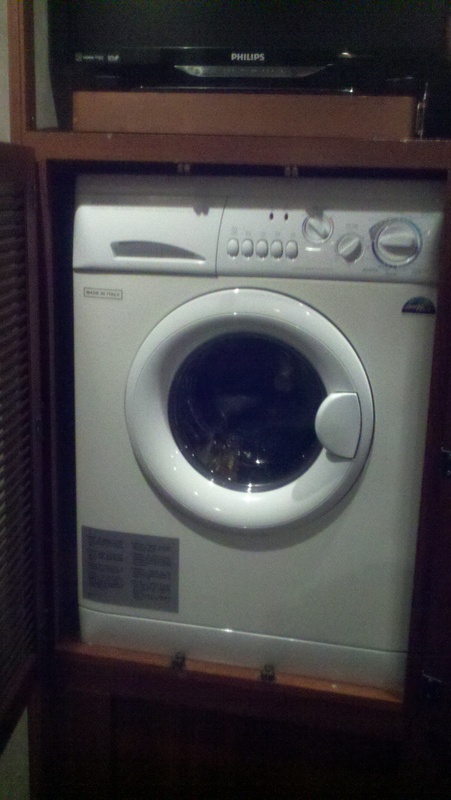 Our Fleetwood Excursion came with a Splendide combination washer/dryer pictured below. It is in our bedroom behind louvered doors in the wall next to our closet at the back of Dora our RV. 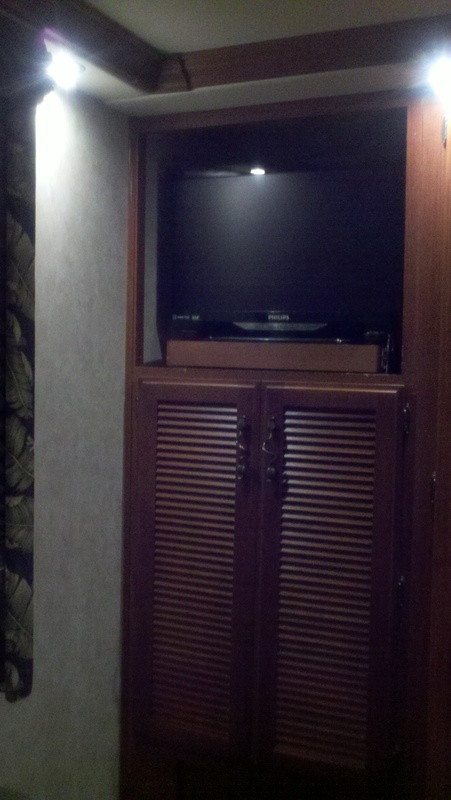 The bedroom TV is positioned immediately above the washer/dryer. It’s really cute and small. It can hold an outfit for one person (example: pair of blue jeans, a shirt and underwear) or a similar sized load of other clothing. Probably ¼ of a load in a normal washer. I do not know where the water goes to because Roy says there is no tubing coming out of it to drain the water. I’m sure we could learn but it washes and dries fine so I’m happy. It’s a mystery to me how it goes from washer to dryer and everything comes out fine each time but I sure won’t question what works! One unit changes from a washer to a dryer all on its own! I only use 2 teaspoons of liquid, not concentrated laundry detergent and 2 teaspoons of liquid fabric softener per load. Quite a money saver there! It has settings for cotton, permanent press and delicate like a normal washer. You set the drying time from 30 minutes to 120 minutes. The washing cycle is very brief compared to the drying. It usually takes 100 minutes to dry and about 20 minutes to wash. While that’s a long time it’s okay because I put a load in when we leave for work, fluff it when we get home and hang things up. Laundry takes just a minute to put away because you have such a small quantity of clothing per load. Now for the weird part about the washer/dryer combo. About four times during the spin and dry cycles it gets to going so fast and hard that the RV shakes and it sounds like a jet landing. Roy says it shakes his teeth! It doesn’t bother me as much as it does him. Our new flat panel TV is in the space above the washer/dryer and I was beginning to think it must be doing damage to the components in the TV with all the shaking but the TV picture is still fine. Roy investigated the shaking this week and found the washer dryer has blocks holding it in place and you can reach it through a panel in the closet. He couldn’t do much without disassembling a lot of things but whatever he did seems to have greatly reduced the shaking. I stopped doing two loads a day when the shaking started being a problem. Since he worked on it I do what I wore the day before the next morning and wash after work what Roy wore during the day. It’s not at all like doing two loads of laundry in a house. It is a very mini version of it and quite doable. Once we retire we’ll have shorts instead of long pants so the loads will be smaller! We have a laundry bin built into one of the cabinets and it’s mostly empty since all our laundry is done each day. 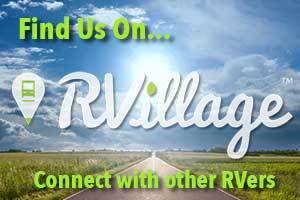 Discussion on RV forums indicate that some people who don’t have the washer/dryer like to use the space for storage and they do their laundry at a Laundromat once a week or so. For now we’re good with storage and I like my little Splendide. I’m sure I’ll have to take blankets and bedspreads to a commercial establishment when the time comes. It’s an odd little machine and has a couple of limitations, but otherwise I think our little washer/dryer will do just fine! One of the very best things about our tiny washing machine is it’s location. It’s right next to the closet and the bed. When the clothes are finished I take them out, lay them out on the bed, grab a hanger out of the closet and hang the clothes up. All without moving from standing in one place!!! No more carrying a whole load of clothes from the bedroom all the way to the laundry room and then carrying the clean clothes back to the bedrooms. The laundry basket, closet and washing machine are all in the same 5 square foot area! Plus I can watch the TV over the washer while doing all of it! Just heard today that our Saints quarterback Drew Brees will take RGIIIs place in the Pro Bowl! Now we have a reason to watch it! < 01.04.13 Black tanks and toilets, oh my!